A little more information from the Riverdale Press, on top of the link to the NY Times story we provided in a post earlier today, about the DEP's controversial blasting plan being stopped by a judge yesterday. Basically, according to both reports, the DEP will not be able to begin blasting until at least Sept. 3. At that point, there will be another hearing to determine whether the DEP will need to complete a new or amended environmental impact study before the blasting plan is allowed to go forward. Court papers argued that “the DEP has no authority to make the decision to begin blasting at the Jerome Park Reservoir without a new, supplemental or amended Environmental Assessment or Review,” according to the Press article. The DEP said it was already in the process of completing a more informal impact study, according to the Press, though previously the agency had said they didn't need to do one. But local residents and elected officials (and aspiring elected officials) railed against the plan at a public hearing two weeks ago. At issue is not only using explosives to excavate 9,000 cubic feet of rock, but also a new plan to truck the rock and other debris from the Jerome Park Reservoir through a slew of densely populated neighborhoods that house several schools (including the area known as the Education Mile that includes Bronx Science, Lehman College and the Walton H.S. Campus). In the first enviornmental impact statement, the DEP said it would truck debris out through a tunnel that exited out of Van Cortlandt Park a couple of miles away. And there was no mention of blasting either. Residents say this is a classic case of bait and switch. The big story from yesterday was that opponents of the DEP's controversial blasting plan for the Jerome Park Reservoir scored a big victory in court yesterday when a judge placed a temporary restraining order on the plan, which was not part of the original Environmental Impact Statement for the project. More on this story later. After a taking a lot of heat from the media, the fund set up by the Yankees and the Bronx Borough President to distribute more than a million dollars a year to local nonprofit groups is finally giving out grants to local organizations. They are still sitting on more than half a million dollars. Two reports show the Bronx is lagging behind the rest of the city in terms of internet access and has the city's worst beach conditions. Interesting story in the Times about a Bronx barber shop owner who is about to stand trial for allegedly running a drug depot out of his businesses and for hiring someone to kill a rival drug dealer. The story focuses on how court documents getting leaked to the public can endanger potential witnesses. Hundreds of west Bronx bus riders are calling for the city to make traveling from Fordham Road to Manhattan easier by restoring local service to Manhattan and restoring a bus stop that was eliminated with the debut of the new, supposedly faster Select Bus Service. Angry residents say the changes are seriously inconveniencing riders and that the Metropolitan Transportation Authority (MTA) did not get community input before eliminating both the Bx12 local service into Manhattan and the Sedgwick Avenue stop on the new Select Bus Service (SBS) route (which used to be part of the old Bx12 Limited route). “People didn’t discover the changes until the bus map was mailed to their homes or boarded the buses,” said Desiree Pilgrim-Hunter, the board president of the Fordham Hill Owner’s Association and a member of the Northwest Bronx Community and Clergy Coalition. Click to read the entire story here. More on the new bus service here and here. A police officer from the 52nd Precinct has been caught on video tape repeatedly beating an unarmed man with a metal baton in the Lower East Side, according to the Post. The officer, Maurice Harrington, who was working a "special holiday detail" on the day of the attack, has had his gun and badge taken away while the Internal Affairs Bureau investigates. Patrick Lynch, of the Patrolmen's Benevolent Association, says Harrington's actions were justified. It's the second time this week that a video tape has surfaced purporting to show a police officer using unnecessary force. In today's Times, columnist Jim Dywer looks at how amateur videography is shining new light on incidents where before the only version of events was the official police version. A Bronx mom is suing the city after her son, a student at the West Bronx Academy for the Future (located on the Theodore Roosevelt High School campas), was allegely dragged out of school in September last year and falsely charged, she says, with assault and robbery. It's Wednesday which means the recently launched farmers market on West Mosholu Parkway North at Jerome Avenue is open. A group of Bronx teens are taking a month-long forensics class at Bronx Community College this summer, says the Daily News. Also in today's News: a homeless man was hit and killed yesterday while walking on the Major Deegan Expressway; Bronx BP Adolfo Carrion is allocating more than half of this year's capitol budget to affordable housing; and Kappstatter's quirky weekly column on the mess that is Bronx politics. Talking of Diaz and Kappstatter, it appears the two aren't on the best of terms. Check out this letter Diaz reportedly wrote to the News' Bronx Boro chief. The New York Sun has a story about a Bronx-born man who's dreaming of winning a judo gold medal at the Beijing Olympics this summer. Brandy Cochrane, founder of Friends of the Woods, is looking for volunteers, performers, and vendors to take part in a block party she's organizing in University Heights for August 30. For details e-mail thewoods@inbox.com. The New York Times followed-up on two stories the Norwood News has been covering for years: the Times confirmed that there is still no timetable on redeveloping the closed and contaminated Old Fordham Library, and residents are still fighting against blasting at the Jerome Park Reservoir and the permit-lacking water filtration plant in Van Cortlandt Park. Congress is investigating whether the city inflated the value of the land for the new Yankee Stadium so they could issue nearly $1 billion in tax-free bonds, the Daily News reports. The Norwood News has previously covered the Yankees stealing parkland and not providing local jobs or construction contracts. Bronx court officials are being probed by City Comptroller Williams Thompson after having allegedly improperly invested $20 million left by New Yorkers who died without wills, the Daily News reported last week. Lawyers and accountants got $2.1 million in fees, while heirs have received nothing. Two hundred and eighty-four construction workers in the Bronx will receive a total of $1.23 million in back pay as part of a settlement over unpaid overtime, the New York Times reported last week. District 37, the municipal employees union, is offering free legal services to any member looking to buy a house, refinance or has been a victim of predatory lending and may be facing foreclosure. The northwest Bronx neighborhoods of Fordham and University Heights have the highest per-capita rate of foreclosures in the city, the Norwood News discovered. Hunts Point is getting rezoned, with protection for residents from the smelly sludge plants (Hunts Point Express), junkyards and scrapyards while paving the way for retail and cultural organizations, the Daily News reports. Will the gritty neighborhood be gentrified? The New York Times' City Room blog has a profile of Nelson Castro, who's hoping to become the first Dominican-born member of the Legislature from the Bronx. The Bronx Democratic party surprisingly selected Castro (Daily News) over incumbent district leader Hector Ramirez for resigning Assemblyman Luis Diaz's seat. Dominicans comprise a third of the Bronx's population. Immigration advocacy groups are fighting against the deportation of Angel, an undocumented Mexican immigrant construction worker from the Bronx, the Daily News reports. He would be forced to leave his wife and five children after being convicted of drunken driving. Despite community groups clamoring for development in the shuttered former Bronx Borough Courthouse, it will continue to remain empty, the New York Times City Room blog reports. The community had been hoping a sorely-needed school would be in place for the fall. Maybe next year? City Council approved legislation to revamp the Environmental Control Board (ECB), which overhears quality of life violations, the Gotham Gazette reports. One of the changes to reduce bureaucracy is that it must provide translation services, which street vendors – who receive five to 20 ECB violations a year -- should be glad to receive. Is The Hub the Next Harlem? The South Bronx’s The Hub/Third Avenue shopping district, the Bronx’s first Business Improvement District, will soon be getting long-awaited retail and office development, the Daily News reports. Developer Related, who’s been chosen for the Kingsbridge Armory project, may help plan a vacant site on 149th Street. The Bronx’s sixth Starbucks may be coming too! Westchester Square is similarly on the rebound, the Daily News finds. Since yellow cabs rarely come up to the Bronx, livery cab drivers in the borough and statewide are likely glad to now have better access to workmen’s compensation, the Daily News reports. The Norwood News previously wrote about Naomi Lozado, a taxi dispatcher on Webster Avenue. The Daily News has a fascinating feature on how downtown Jamaica, Queens receives more than 12,000 out-of-town visitors every year. Similarly, the Bronx’s popular Fordham Road commercial corridor receives more than half of its shoppers from outside of the borough, according to the Fordham Road Business Improvement District. Lehman College hosted the second annual Eurobasket Summer League where 86 college and professional basketball players hope to hop the pond and play overseas, the Daily News reports. In a few years we may be seeing the same with the Bronx's brilliant cricketers. Just got off the phone with Pedro Espada, who tells me last night's Youtube video is just another example of the desperate measures Efrain Gonzalez will go to retain his senate seat. Espada said Gonzalez will do anything to distract people from the dwelling on the fact that in October the incumbent senator is facing an extremely serious federal trial on fraud and corrpution charges. Espada said the Gonzalez campaign is challenging not only his residency, but also the validity of his petition signatures in court and invited me to come see him emerge victorious when he goes in front of a judge next week. Espada admitted that he also has a home in Mamaroneck and says he's owned that home since 1991. He would not comment on how much time he spends at each residence. Martinez Alequin is the editor of an online publication called NYCfreepress.com, according to the Web site, which Espada says is also funded by taxpayer money provided by Gonzalez. The Web site does not say how it's funded. But the site also has a link to a blog, yourfreepress.blogspot.com that mostly disparages Espada and says positive things about Gonzalez. The blog has only one link -- to Sen. Gonzalez's own personal blog, called The BX. 33 Report (a reference to the 33rd District that is up for grabs this year). And one other note: the Free Press blog posted the Espada Youtube video last night. The post below it is a story from the National Enquirer about John Edwards having a second family. Other posts include stories copied and pasted directly from other media outlets, usually with some kind of attribution. But there's one post that we thought looked very familiar to a post written on the West Bronx Blog by Highbridge Horizon editor Tony Richards about citizen complaints at the 44th Police Precinct. Here's Tony's post. Here's Martinez Alequin's post. In fact, it's a word-for-word rip off. I guess imitation is the greatest form of flattery, so thanks. Sorry, meant to keep this short, but just spoke with Martinez Alequin who tells me he indeed was hired by Sen. Gonzalez a month ago to do "communications" work 17 and a half hours a week. He wouldn't go into more details and said we should ask Gonzalez for more details. He said the Free Press Web site is run independently with no financial help from the senator and that he went to Espada's co-op last night as an independent journalist. Last night, while Bronx Democrats were bickering amongst themselves in Marina Del Rey, Pedro Espada, Jr., was busy trying to host a fundraiser for his state senate campaign to unseat embattled incumbent Efrain Gonzalez while defending himself against angry residents at a co-op where he recently purchased an apartment. In a Youtube video sent to the Norwood News by Gonzalez's son Carlos, residents confront Espada in the lobby of the co-op, saying they don't appreciate him using their building to further his political ambitions. Two residents say they hadn't seen him around and that he only recently moved in furniture and a couple of air conditioners. A shareholder at the co-op told us a similar story yesterday. Gonzalez says the video was created by a volunteer for the Gonzalez campaign. The end of the video claims to show Espada's car parked outside of his other residence in Mamaroneck, though that can't be confirmed from watching it. Espada was not at his campaign office to answer questions earlier today. The Norwood News' last issue before our annual one month hiatus is filled to the gills with great stories and valuable information. Here's a quick preview of what you can find online and on streets now. Community residents and leaders want more from the new Kingsbridge Armory project than just retail, saying as much at a brainstorming session last week. Residents at Tracey Towers cried foul after police failed to answer a 911 call on July 4. Two hours after the call, a young man was shot in building's parking lot. After three surgeries, the young man remains in critical condition. Bronx street vendors seek legitimacy through proper permits, but city ihas been reluctant to provide more of them. Opponents of a city plan to blast rock in Jerome Park Reservoir say they will file a lawsuit against the DEP if the plan goes forward. There's also the not-so-small matter of the DEP's lack of building permit for the filtration plant project in Van Cortlandt Park. With the Democratic primary coming up in a month and a half, familiar foes are lining up for a shot to replace legally embattled State Senator Efrain Gonzalez. They come with baggage of their own. Also, check out our Web-expanded Neighborhood Notes listing of community events, services and programs as well as our Out & About entertainment and arts guide. 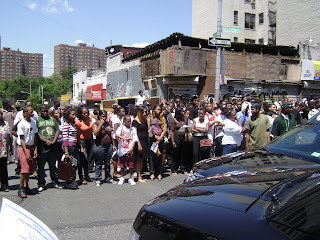 Stay tuned to the West Bronx Blog for daily info, updates, stories, photos and links. At exactly 12:01 a.m., Montefiore Medical Center took over all operations at Our Lady of Mercy Hospital in Wakefield. The hospital will now be called "Montefiore North." They made the announcement this morning at 10 a.m. Most staffers we spoke with at the opening said they thought the change would be positive. OLM had been experiencing serious financial problems and Montefiore basically stepped in to save the facility from closure. Dr. Steven Safyer (above), Monte's president and CEO, said the hospital was "bleeding financially" and believes Monte can be the tourniquet. Safyer said they planned to keep all of the hospitals employees on staff. The first baby born under new management was Joevan Eliel (pictured with mom, Vanessa Alvarado) who was born at 1:17 a.m. 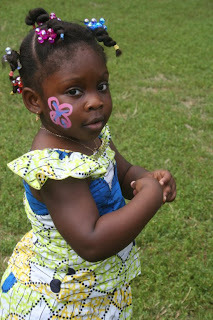 Here's some cheery shots of the second annual African United Day Parade, held last Sunday in Crotona Park. 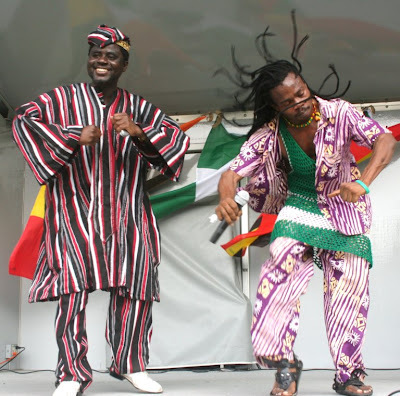 The event was organized by the African People Alliance, a Bronx-based group formed last year to bring Africans of all nationalities together, as well as to provide services to the borough's growing African population. The Floating Pool Lady is drawing lots of attention to Barretto Point Park this summer: more than 900 visitors each day according to NYC Parks Department staff. This should come to no surprise considering the quality of the locker rooms, ample pool deck, ice cold water, and gorgeous view of the Manhattan skyline. This pool is the perfect spot to escape the hazy, hot, and humid days of summer. Not lost in the excitement of the pool is the beauty and high maintenance of Barretto Point Park. Brought into being by the efforts of community residents and non profits like Sustainable South Bronx and the Point CDC, Barretto is the first step in a larger effort to create a South Bronx Greenway. The South Bronx Greenway would create bike and pedestrian paths around the Hunts Point and Port Morris waterfront. Thought Hector Ramirez was the Bronx Dems' choice to replace resigning Assemblyman Luis Diaz? Well, apparently that's just not the case. Liz Benjamin of the Daily News' politics blog has the details. Bronx youth rallied outside of Yankee Stadium this afternoon, just hours before the All-Star Game was scheduled to start, calling for more and better jobs and emphasizing the stark contrast between the billion dollar new Yankee Stadium and the daily lives of mostly poor Bronxites. More than 20 youth from the Northwest Bronx Community and Clergy Coalition (NWBCCC)’s Sistas and Brothas United advocacy arm were joined by speakers from the Urban Justice Center, the Retailers Union and the Fordham Evangelical Lutheran Church. Media outlets and local politicians have been saying the “Bronx is Booming” over the past year, in build up to tonight’s Major League Baseball All-Star Game at Yankee Stadium. Indeed, there is significantly less crime and more development than 31 years ago, when the Yankees last hosted the Midsummer Classic. Borough President Adolfo Carrion, Jr. released a short report to media outlets today emphasizing these changes. But the resurgence, which includes the Yankees’ controversial new billion-dollar stadium, has not translated to living wage jobs or improved public education, according to a new report [PDF] published by the Urban Justice Center and the NWBCCC. Tomato/Cucumber/Onion and garlic salad drizzled with olive oil. Simply: sliced tomatoes and cucumbers (longways), layered. A couple of slices of sweet onions finely chopped and sprinkled on top of the cucumbers and tomatoes, a bit of crushed and minced garlic sprinkled on top as well. Drizzle olive oil over all and salt to taste. 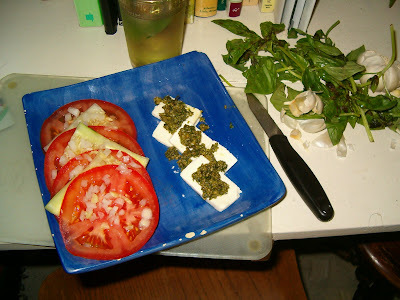 Pesto and Colombian white cheese. In a food processor (blenders or mortar and pestle can be, um, a bit tedious), blend 2 loosely packed cups of basil, ½ to 2 (or more!) cloves garlic, crushed, 2 tbls to 1/3 cup pine nuts or walnuts, lightly toasted, 1/2 cup extra virgin olive oil (or more!) and ½ cup Parmesan or other hard cheese. Note: if you are going to freeze pesto, don’t add cheese until after thawing. Also, cheese is optional, especially if using other herbs such as cilantro, mint, arugula, etc. As I was also using “what’s in the fridge” the cheese I used was salty enough, so very little salt was added to the original pesto. Baked tomatoes. A friend suggested that I bake the remaining sliced tomato, low on 250 for a couple or three hours, with a bit of olive oil and salt. While I lamented the baking after eating the fresh tomato/cucumber/onion and garlic salad, I was joyous with the baked results several hours later . . .
And for a pesto encore the next night: chicken, pasta, pesto and sweet baked tomatoes. For more info on the Greenmarket, check out this article from the last issue of the Norwood News. Community Board 7 and its adjacent boards (8 and 12) will hold a hearing tonight at Lehman College to discuss the Department of Environmental Protection's controversial plan to blast at the Jerome Park Reservoir. The meeting is from 6:30 to 8:30 in the Lehman Faculty Dining Room in the Music Building. For more information, call CB7 at (718) 933-5650. The Times had this editorial on Sunday about MLB and the Yankees dissing of the Bronx to the extent that they didn't even come up with a few tickets for local Little Leaguers for the big game today. It's All-Star Game Day today and we expect to periodically post throughout the day about various ways the Bronx is getting the cold shoulder from Major League Baseball and the Yankees. And, speaking of the All-Star Game, here's a notice about a press conference later today where the Urban Justice Center and the Northwest Bronx Community and Clergy Coalition will release a report about how the so-called Bronx Boom is leaving its residents behind. WHAT: Before the first pitch gets thrown at the MLB All-Star Game, the Northwest Bronx Community & Clergy Coalition (NWBCCC) and the Urban Justice Center will be joined by dozens of Bronx residents to release Boom for Whom? How the Resurgence of the Bronx is Leaving Residents Behind, a new report based on hundreds of community surveys and US Census statistics which finds that Bronx residents continue to face staggering unemployment and low-paying jobs, in stark contrast to the recent commercial development that many claim is revitalizing the borough. West Bronx Assemblyman Luis Diaz is stepping down to work as Gov. Paterson’s downstate community affairs person, according to the Daily News' Bob Kapstatter. Bronx State Senator Ruben Diaz, Sr. is running for re-election this year as both a Democrat and a Republican, according to this post on the NY Times City Room blog. Diaz, Sr., whose son Ruben Diaz, Jr. is running for Bronx Borough President, is facing a couple of challengers on the Democratic side, but none from Republicans. Looks like he's trying to pull a Joe Lieberman, the Connecticut Senator who lost the Democratic primary last year, then re-invented himself as an Independent and took the general election. The 44th Precinct --which includes Highbridge --generated the third-highest number of complaints against the NYPD in 2007 among the city's 123 total precincts. The 44 was the source of 244 complaints filed last year with the Civilian Complaint Review Board (CCRB)-- the city agency that reviews civilian allegations of police misconduct--according to the agency's most recent status report. This figure ranks the "44" behind only the 75th Precinct, covering East New York, Brooklyn (349 complaints), and the 73rd Precinct, covering Ocean Hill/Brownsville, Brooklyn (280 complaints), according to recently-departed CCRB spokesman Andrew Case. Data provided by Case also shows that 2007 marked the fifth consecutive year in which the 44 had the highest number of CCRB complaints among Bronx precincts. While the 44 saw a slight decrease in complaints from 2006, when it generated 255 complaints, the 2007 total still represents a considerable increase from 2003, when 160 CCRB complaints originated in the precinct. This pattern, in fact, reflects a citywide trend : According to the status report, 7,759 civilian complaints were filed with the board in 2007, a figure that, while slightly lower than the total for 2006 (7,662) still constitutes a 36 percent increase over the 2003 total and an 84 percent jump from 2000. In its report, the CCRB asserts that one major factor in the significant rise in complaints over the past several years is the city's 311 system, which was launched in March 2003. The board bases this summation on the fact that "complaints filed by telephone [as opposed to forwarded from the NYPD] make up an ever-increasing portion of the complaints filed directly with the CCRB- over 87 percent in 2007." The board does not publish a direct number, so 311 is likely the only way to contact the CCRB that most civilians are aware of. Edward Brewer, Theresa Norris, Virginia Brewer and Bruce Wang played a Bach trio sonata for listeners escaping the heat yesterday at Fordham University. 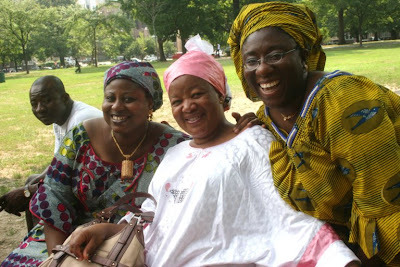 It was the second of the Bronx Arts Ensemble Summer Music 2008 series that takes place every Sunday. Each performance is a double header: first musicians perform at 2 p.m. in Van Cordlant Park's Rockwood Drive Circle. Then the musicians go indoors and perform again at the McGinley Center at Fordham University at 4 p.m. Learn more at www.bronxartsensemble.org. More than 150 people attended the Bronx Museum of the Art's First Friday event on July 11th. The large audience was treated with a delightful performance of jazz history, music, and tap dance, along with an incredible spread of food and drink. The night opened with a brief introduction by Maxine Gordon, Senior Interviewer and Jazz Researcher for Fordham Univeristy's Bronx African American History Project. Ms. Gordon is a Ph.D. Candidate in History of the African Diaspora at NYU and talked about the history of jazz music in the Bronx and its connections with the better-known Harlem jazz scene. Following the talk, the Ray Abrams Big Swing Band took hold of the audience with two sets of swing and jazz music. The band, comprised of five saxophones, four trumpets, three trombones, an upright bass, drummer, keyboard player, and one frenetic conductor, fed off each other's individual performances in a traditional jazz performance style. Tap dance performances by members of Hoofer's House, a talented group of improvisational tappers based in Harlem, were interspersed throughout the band's sets. While the band provided background music, the dancers tapped out melodic rhythms with style and sass. 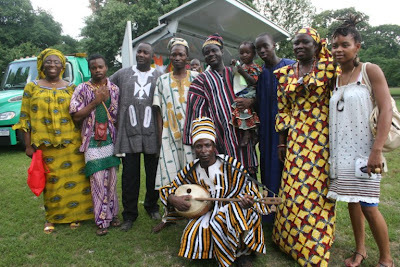 The next First Friday event at the Museum will be an outdoor African Film Screening and music performance on August 1st from 6pm to 10pm. The event will take place at the Andrew Freedman Home at 1125 Grand Concourse at McClellan street. The Times' has a story in Saturday's paper about the resurgence of University Woods, a three-acre park in University Heights that routinely been named the city's worst. As we reported on this blog last month, Friends of the Woods, a group run by local residents, no longer sees the need to organize clean-ups; instead they give tours. In August, the group are putting on a block party in the park. Tomorrow morning there's a planning session in a local church. All are welcome. Despite this activity, University Woods' future is far from secure. As the Daily News reported last year, community leaders would like to see the land developed and condos built. The photo above was taken last summer by Alma Watkins, a Mount Hope-based photographer and a regular contributor to the Mount Hope Monitor. Hundreds of people filled Mount Hermon Baptist Church this morning to honor the memory of Andre "Pop" Davidson Jr. , the lifelong Highbridge resident and basketball star who died last weekend at the age of 18. And perhaps an even more impressive testament to the impact Davidson's life and death has had on his community was the huge crowd that came to view his body before services began; the viewing lasted nearly two hours, and when it was cut short due to time limitations, there were still mourners waiting to see him. In fact, so many people packed Mount Hermon Baptist Church that Wenzell P. Jackson, the church's Pastor, repeatedly asked the crowd to clear the aisles for safety reasons. Eventually, those who had already seen Davidson's body were asked to go outside temporarily in order to allow space for those waiting to enter. The scene at the church, on the corner of West 167th Street and Nelson Avenue, was one of raw emotion. As those in attendance --a considerable number of whom appeared to be in their teens or twenties --approached Davidson's casket, many sobbed uncontrollably or collapsed into the arms of friends and family. Some shook their heads in disbelief that Davidson, who had graduated high-school less than two weeks before his death, was gone. One woman, after viewing the body, screamed, "That's not even Pop!" Many people wore t-shirts with Davidson's picture ,and some had "R.I.P. POP" carved into their heads. Those who spoke at Davidson's service included Duvall Taylor, Davidson's oldest brother; coaches from the Kennedy High School basketball team, where Davidson was a starting forward last season; Matt. St. Croix, head basketball coach at Mohawk Valley Community College in Utica , where Davidson was slated to play next season; Mary Blassingame, Davidson's great-aunt (Blassingame was joined at the pulpit by Nicole Givens, Davidson's mother); Helen Diane Foster, councilmember for the 16th District ; and Foster's father, former 16th District Councilember Rev. Wendell Foster. All described Davidson as confident and charismatic. "Pop could walk into a room, and even if you didn't like him, he would make you like him," Taylor said. Taylor also praised his brother's skills on the basketball court. "He would embarass you. And then he would tell you about it," Taylor said. "And then he would call your mom and tell her about it." Both comments drew appreciative laughter from the crowd, as did Taylor's recollection that "Me and Pop used to talk for hours --about him." Johnny Mathis, head coach at Kennedy High, hailed Davidson's versatility as a basketball player, but emphasized his qualities as a person. Mathis noted that a reporter had interviewed him recently, searching in the process for any potential negative elements of Davidson's personality; Mathis said he grew frustrated, because there weren't any. Davidson's teammates from Kennedy High entered the church together, and sat side by side in the pulpit, many of them wearing their red-and-white jerseys. Mathis said this unity and love for one another was a defining element of the team at all times; not merely on the particular occasion. St. Croix said that, although he would never get the opportunity to coach Davidson or develop a close relationship with him, Davidson had made a very positive first impression on him. St. Croix described Davidson as "polite" and "respectful," and added that Davidson would always look people in the eye when he shook their hand. St. Croix suggested these qualities reflected the influence of friends, family, teachers, and others close to Davidson. Helen Diane Foster said Davidson's life disproved negative media portrayals of African-American males. "Here was a Black boy doing something," Foster said. Like the other speakers, Foster urged mourners to find inspiration in the example of Davidson's life. 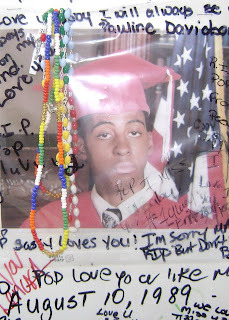 Davidson, who would have turned 19 on August 10, will be buried in the same cemetery as his father, Andre Davidson Sr. The elder Davidson died in 1997 at age 29. Davidson is survived by his mother, Nicole Givens; his brothers Duvall and Brandon; his sister, Evelle; his great-grandmothers Rhoda Lucas and Helen Davidson; his grandmothers Beverly Davidson and Margie Lucas; his grandfathers Reuben Givens and Albert Smith; his aunts Robin, Stephanie, Carera, and Brandy Givens; and his uncles Smokey, Kyle, Samuel, and Dante Burnette. Taylor, Davidson's eldest sibling, seemed to capture the theme and the mood of Friday's service particularly well with one comment. "I think you all lost a brother," Taylor said. Services for Andre "Pop" Davidson Jr. -- the lifelong Highbridge resident and basketball star who died last weekend at age 18 -- will be held Friday at 10am, at Mount Hermon Baptist Church. 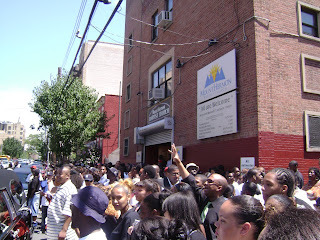 The church is located at 1170 Nelson Avenue (W. 167th Street). 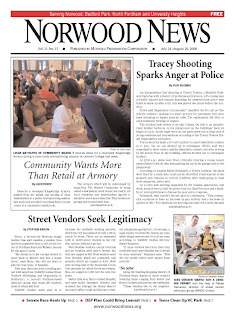 The newest edition of the Norwood News is jam-packed with important stories about the northwest Bronx and it's online and on the streets now. Pick it up for free or browse through our award-winning Web site. After a string of damaging blows to her public image -- including an atrocious attendance record at Council meetings and hearings, exorbitant phone bills and the funding of a non-existent tenants association -- The Norwood News spent two months gathering up the details and trying to get Councilwoman Maria Baez to tell her side of the story. Read the entire story here. A successful program for high school dropouts in the northwest Bronx slated to be closed will stay open for at least another year. We examine the complex and controversial trend of private equity firms scooping up scores of Bronx apartment buildings. Plus, Bedford Park nuns assure a successful school's future by leasing their land...the story behind the new Farmers Market in Norwood...Crime down overall in 52nd Precinct, but same-old problems persist...Speaking of crime, vandals completely trashed the Oval Park rec center in Norwood, shutting the place for three days in the middle of summer. Also, check out our expanded Neighborhood Notes section as well as Out & About, our entertainment and arts guide. And don't forget to sign up for our e-mail edition and breaking news alerts by filling out a tiny form and creating a Norwood News acount. A second planning session for Friends of the Woods' August 30th block party is taking place 11:30 am this Saturday at University Heights Presbyterian Church (2617 University Ave.). The session seeks to give local residents an opportunity to discuss what they would like to see at the party and to voice their concerns over the possible destruction of University Woods. University Woods has become the site of an on-going debate between the local community board, who want the land developed, and a number of local residents who have been working to clean up the park and preserve it as a usable public space. 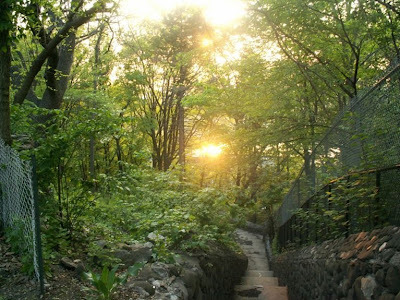 University Woods, near BCC, is often derided as New York City's worst park; though it has seen marked improvements from organized community clean-ups by Friends of the Woods. Juan Gonzalez takes a look at how little love the Bronx is getting, despite being the home of the All-Star Game at Yankee Stadium on July 15. He reminds of us of Howard Cosell's famous words at the 1977 World Series: "Ladies and Gentlemen, the Bronx is burning." The least Major League Baseball could do, borough leaders say, is hold one significant All-Star week event in the resurgent borough. But they're getting the cold shoulder. Bill Aguado of the Bronx Council on the Arts says a group of Bronx nonprofit leaders wrote to MLB a year ago asking them to help the world see the new Bronx. All they got was a nasty reply ordering them to cease and desist using the term "All-Star," because it's trademarked. Three days after 18-year-old Highbridge resident and basketball star Andre "Pop" Davidson Jr. collapsed and died, his death remains wrapped in controversy. Davidson, a starter this past season at John F. Kennedy High School, collapsed Saturday afternoon at St. Mary's Rec Center in the Mott Haven section of the South Bronx, while competing in a one-day basketball tournament. The gym where he was playing does not have an air-conditioner, and many of Davidson's family members told the Highbridge Horizon today that they believe his death was heat-related. Megan Cuccia, a spokesperson for the city medical examiner's office, said the cause of Davidson's death was under investigation, and that further tests needed to be performed. Cuccia said she could not release any of the examiner's preliminary findings. Addressing reporters yesterday, Mayor Michael R. Bloomberg downplayed suggestions that the lack of air conditioning at St. Mary's was to blame for Davidson's death. "I haven't seen the Medical Examiner's report about exactly what happened," Bloomberg said. "Generally, 19-year-olds [sic] don't drop dead of heart attacks, or whatever happened in this case. And it's not clear that air conditioning would have made any difference." Calls to St. Mary's Rec Center late Tuesday afternoon were referred to the city parks department, which had not returned requests for comment as of this posting. Davidson is not the first member of his family to die under controversial circumstances. On August 15 1997, his father, Andre Davidson Sr. , died at the Green Haven Correctional Facility in Stormville, NY, after suffering an asthma attack. A nurse took 40 minutes to respond to other inmates' calls for help, and, upon finally arriving, did not have resuscitation equipment. The elder Davidson's mother, Beverly, ultimately won a lawsuit against the state of New York and was awarded $900,000. The younger Davidson's 16-year-old brother, Brandon Givens, is also asthmatic, but Givens said Davidson was not. Davidson's family described him as extremely healthy, and said he did not have any medical conditions that would have made him especially sensitive to heat. Asked if he was taking any medications that could have played a role in his death, his mother, Nicole Givens, answered in the negative. "He wouldn't even take his vitamins," Givens said. Davidson's great-grandmother, Rhoda Lucas -- who raised Davidson since 1993-- said she last saw him alive around 12:30 pm on Saturday, when he left her home on Woodycrest Avenue for St. Mary's Rec Center. A few short hours later, she received a phone call from one of his teammates, who informed her that Davidson had collapsed and urged her to rush to the gym. By the time she arrived at St. Mary's, an ambulance was taking her great-grandson to Lincoln Hospital, where he was pronounced dead a short time later. David Barbosa, a friend of Davidson's, was in the gym when Davidson collapsed. Barbosa said that on his final basketball play, Davidson stole the ball from the opposing team, went up for a lay-up, and was fouled, before falling backwards. Barbosa said Davidson then began bleeding from the mouth and nose. Friends and family also said that, after collapsing, Davidson began shaking; they said Davidson had never experienced a seizure before. Davidson was the nephew of actress Robin Givens, who starred in films such as "Boomerang," (1992) and "Blankman" (1994). Her other acting credits include apperances on several television shows, including "Head of the Class," "The Cosby Show," "The Fresh Prince of Bel Air," and "House of Payne." Funeral services for Davidson are scheduled for 10am this Friday, July 8, at Mount Hermon Baptist Church on 1170 Nelson Avenue. We're skipping August, so the next paper will come out Sept. 1. Brandon Givens, younger brother of the late basketball star Andre Davidson Jr. , shared his memories with the Highbridge Horizon Monday afternoon. Andre "Pop" Davidson Jr. , 18, collapsed while playing a basketball tournament game Saturday afternoon at St. Mary's Rec Center, in the Mott Haven section of the South Bronx. He was pronounced dead a short time later at Lincoln Hospital. The cause of death remains unclear. The passing of Davidson -- a renowned playground basketball player in Highbridge who averaged 8 points and 8 rebounds per game as a starter for John F. Kennedy High School this past season -- has brought grief to his neighborhood, friends, and family. "Me and him was the best of friends," Givens said, as he sat on the steps outside the home where he and Davidson lived with their great-grandmother, Rhoda Lewis. "We loved each other. We were close together -closer than anybody." Givens said his brother earned the nickname "Pop" early in life. "They gave him that name when he was little," Givens explained. "He was so skinny, they used to call him 'popsicle.' "
Givens said that Davidson liked to instruct his younger sibling both off the court and on it, often coaching Givens on shooting and other elements of basketball. He described Davidson as a fearless competitor who admired NBA stars Allen Iverson and Tracy McGrady because of their "explosive" quickness on offense and their jump-shooting abilities. In addition to Nelson Park in Highbridge, Givens said, "Pop" took on all challengers in Orchard Beach, Washington Heights, and courts throughout the city. And he wasn't afraid to have some fun doing it. "He loved to talk trash," Givens said. "He'd be like, 'Guard up, little boy.'" In addition to the time they spent together at the basketball court, Givens said he and Davidson liked to hang out together at friends' houses and in midtown Manhattan. He added Davidson frequently told him that if he moved away from Highbridge, he wanted Givens to accompany him. Givens, who just completed junior high-school at IS 229 in Morris Heights, will attend Kennedy High School next fall. Like his brother, he plans to excel on the school's basketball squad. And, also like his brother, he plans to wear #23. "When I play varsity, they're gonna give me his jersey," Givens said. "And every time I play, I'll think about him." The “Floating Pool Lady,” a seven-lane pool on a barge, opened on June 27 in Barretto Point Park in the Hunts Point neighborhood of the Bronx. The pool barge will be docked on a pier in the East River by this park through September 1, 2008 (Labor Day). The pool is open Monday through Sunday from 11am to 7pm. The presence of the Floating Pool Lady is a great attraction to draw residents to this beautiful park that opened in October of 2006. While the Floating Pool is operating, the MTA will run buses every 30 minutes to the park from the Prospect Avenue 2 and 5 train station and the Hunts Point Avenue 6 train stop. The freshwater pool features a pool house, locker rooms, bathrooms, and a gangplank connecting land lubbers to the pool. The entire facility is ADA compliant. From the pool deck, visitors have beautiful views of North Brother Island (site of the sinking of the General Slocum in 1904, NYC’s worst maritime disaster, and former location of Riverside Hospital home to Typhoid Mary) and New York City’s waterfront. Check out this story about Bronx tourism opportunities from the USA Today Travel section. Mostly focuses on the Botanical Garden, the borough's expansive parks and other green spaces. It also touches on the Bronx's burgeoning restaurant scene and, of course, the Yankees. The story quotes a couple of random people, including a French tourist at the Garden and a guy named Robert Francelli, who was ordering lunch at Mike's Deli on Arthur Avenue. The author didn't talk to the Bronx Tourism Council, but did speak with George Fertitta, CEO of NYC & Company, the city's marketing and tourism organization. And speaking of the Yankees, the story doesn't mention the upcoming All-Star game on July 15 that will be played in the Bronx at the soon-to-be-replaced Yankee Stadium. It might be because most of the events, besides the game, are happening in Manhattan. It seems like the borough could do more to capitalize on this event, but we haven't heard anything. New York City’s first bus rapid transit line was announced yesterday at a press conference headlined by Metropolitan Transportation Authority’s CEO Elliot G. Sander and a handful of other MTA, New York City Transit, Department of Transportation and elected officials at Fordham Plaza in the northwest Bronx. The new Select Bus Service line will complement the popular Bx12 Limited route and will cut across the middle of the Bronx, from Inwood in Manhattan to the Bay Plaza Mall or Orchard Beach in east Bronx. Transit officials say there is a five-minute cut in travel time due to bus innovations. The service actually started on Sunday, but made its official and staged debut Monday morning. There are three big changes that riders must adjust to along with the two-toned buses with the polka dot seats. Riders must pay before they board –- with their MTA card or with cash for the standard $2 fare -- but can board by either front or rear doors. Also, dedicated bus lanes and traffic signal priority and coordination will be in place to help speed up the new bus line. Riders yesterday were confused at having to pay before boarding, but transit aides helped guide the process. It's unclear how long the aides will continue to help riders adjust to the new system. And yes, every official there took the Select Bus Service through the Bronx after the press conference. The Times took a ride on the bus yesterday and also found confusion among riders.